Size: 30 x 18 x 48 (Front Length x Depth x Height) in inches approx. 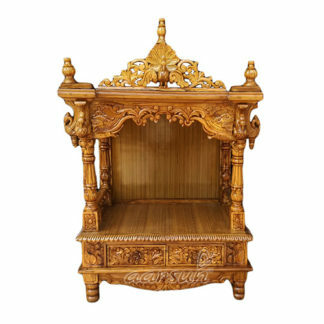 Aarsun Woods brings to you Wood Temple – Mandir for Home and Office made in Teak Wood (Sagwan or Sevan as it is called) in premium natural wood finishing. The pooja temple is hand-carved by skilled artisans known for their craftsmanship in Mughal era designs. Home Temple consists of a beautiful carved Mehraab with dancing peacock in the center and floral carving at the sides. The edges have four shikhars carved in Kalash design. The central part known as Garbgriha has ample space for comfortably placing your diety. The Garbgriha is guarded by beautiful pillars on all four sides. the pillars are carved in fine floral and peacock carving at the top and a front mehraab with elephants and garland designs. The pooja temple has two full drawers for keeping all your pooja essentials at one place. The wood temple is supported by four legs with beads design. The Temple is made from Teak wood with the base, back and the ceiling made from premium quality teak ply to stabilize the Temple. Teak wood is one of the finest quality hardwood which has termite resistance and is highly durable to withstand extreme weather conditions. The unit lasts long as any other Wood furniture already at your place. As we are the manufacturers of the unit, the Home Temple can be made exactly as per your need. Contact us via Amazon Messaging or google us to get the Temple customized as per your need. Teak wood is also known as (sagwan saugan). Teak wood does not shrink or wrap due to moisture condition. Mostly high demand of furniture’s especially that are made of teak hardwood in interaction to its quality. Teak wood is mostly popular for outdoor furniture. But People like to buy a set teak wood furniture. Teak wood only not famous for outdoor furniture it also famous for indoor furniture. Excellent Durability: Teak wood is excellent durability can be counted one of the most significant. It wood comes in a natural teak tree. Teak wood is hard and you can put heavy thing top on it, teak wood is always just be fine. Very Strong: Teak wood is a hardwood obtained from broad leaved deciduous trees, and it is exceptionally strong when compared to other wood types such as Sheesham and Mango Wood. Moisture Resistance: Teak Wood has a good resistance to moisture and water. That why it is the preferred to best wood. Because of this very quality, it is widely used to make Wood furniture. It’s heavy: Teak wood is a very dense wood which can be considered a beneficial quality, because a very basic rule in woodworking is that the heavier and denser a wood is, the stronger it will be. Termite Resistance: Teak wood has a natural oil content that resists termites (white ants), fungal stains, and also resist other insects that can end. Teak wood is good compared to many other wood collection. High Dimensional Stability: Properly teak wood does not warp or shrink as compared to other wood materials. It is a stable material and absorb its dimensions. Well-dried wood is not easily affected by climate changes. Easy Maintenance: Teak wood can easy to clean and maintenance.